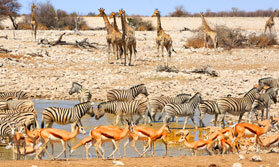 Okonjima Plains Camp enjoys the beautiful surroundings of rolling hills and sweeping plains. It is home to the AfriCat Foundation which is dedicated to the preservation of leopard, cheetah, lion and the other big cats in Namibia. During your stay here you can learn about the big cats, conservation and even see them up close and personal! There are also other animals on the reserve that you will come across including some interesting nocturnal animals. The camp was recently rebuilt, but the design still pays homage to the cattle ranching roots of the Hanssen family who bought the farm back in 1970. The main building, known as The Barn has been well thought out. It houses the reception, curio shop, the lounge, dining room and bar. It is open plan and spacious, huge in fact and spread over two levels. Large windows offer protection from the elements but give a feeling of openness and allow uninhibited views of the surrounding countryside. You can enjoy after dinner drinks outside by a roaring fire. There are two types of rooms, 14 standard rooms and 10 view rooms. They are equally beautiful and decorated in a modern, uncluttered style with blue and green hues. Despite only one type bearing the name ‘View’, both have views over the plains in front of the camp. The main difference is the View rooms are newer, larger and have more attention to the little touches. The standard rooms are still spacious and offer an excellent bed for the night in a relaxed, friendly and informal atmosphere. Open: Okonjima Plains Camp is open all year round. Rooms: There are 14 Standard Rooms and 10 View Rooms. They are all tastefully decorated and spacious with en-suite facilities. The View Rooms are newer and larger than the Standard Rooms, they have a larger veranda. All rooms have ceiling fans, mini-fridge, tea and coffee and a safe. Activities: The camp is home to the AfriCat Foundation. Apart from self-guided walks all other activities are extra. 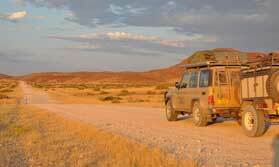 These range from tracking the big cats in a 4x4 and on foot, night drives and guided walks. If you are staying long enough you may also get to visit AfriCat’s Information & Carnivore Care Centre. Facilities: The Barn houses the reception area, curio shop, lounge, bar and dining area. There is also an outdoor dining area and a secluded swimming pool. Dining: Dining is at separate tables. Children: Children of all ages are welcome, although there are age restrictions on the activities. Health: This is a low risk malarial area. Communication: Mobile phone signal is generally quite good. There is WiFi in the main area, a computer with internet and a telephone in the main area that guests can use. A classic introduction to Nambia from beach to desert. Experience Namibia together as a family on this epic self-drive holiday visiting some of Namibia's highlights. A small group trip combining safaris, adventure, culture and camping, travelling through deserts and valleys to the coast, with 4 magical nights camping in the bush. Guests at Okonjima contribute indirectly to the AfriCat Foundation. 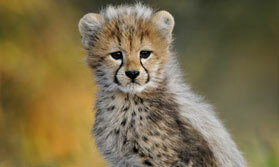 The Foundation's main focus is education and research with the long-term goal of conserving Namibia's large carnivores. "We were accomodated at the 'Bush Camp' instead of the Plains Camp as our itinerary stated. This was apparently an up grade but i'm not sure if this is the case. However, it was a lovely place to stay. Food was excellent and surroundings were lovely, including the pool. " "The view room was stunning. Well organised game drives. We did one pm Leopard drive and one am Cheetah drive. Both successful and making the most of our one night stay which we felt was enough. "